Well to start with an intimate wedding quite understandably does not suit everyone’s palate and sometimes would be plainly not feasible owing to your guest list but if you are somewhat the discerning sorts and would rather prefer things that are niche and exclusive then we reckon wedding in a boutique hotel or a villa would be for you. More than anything the basic idea of having such wedding is to have a wedding that is a reflection of the person that you are and also so you wouldn’t have to worry about the twitched eyebrows from your beloved Aunt Agatha. This is not to say that you cannot have the kind of wedding in a luxurious hotel but the ‘privacy’ and ‘your own space’ that you have at a boutique hotel or a villa is nonnegotiable. When it comes to intimate weddings our vote goes to the hippest wedding destination in India: Goa. Some of the properties are hidden away gems while others are a little more popularized, some overlook the beach while others have sun-dappled gardens and courtyards, some are located in a charming village while others are just a few minutes away from chic clubs and bars. As a matter of fact, there are way too many boutique properties and villas in Goa and you might just feel overwhelmed with the choices that are available for your wedding. The task becomes rather daunting when you are looking for such a venue for your destination wedding. So we have curated a list of offbeat whilst immensely charming Wedding Venues for your small numbered wedding in Goa. Vivenda dos Palhacos, Wedding arranged though not in the desi sense of the world. Cocooned in the coconut groves of the Majorda village is a one-hundred-year-old Hindu-Portuguese hacienda bustling with undeniable charms. 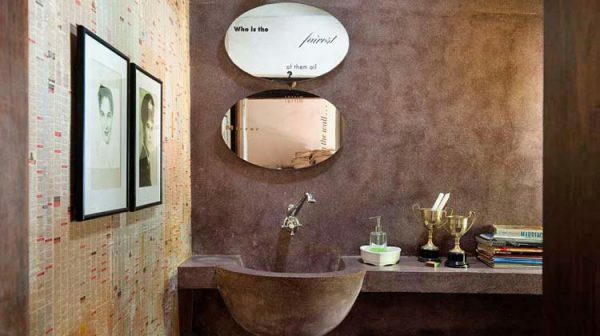 The boutique hotel or house lives up quite literally to its nomenclature Vivenda dos Palhacos (translating to House of Clowns) as it is filled with plenty of tongue-in-cheek details. Spread over the mansion are seven air-conditioned rooms, two in the front Portuguese part of the house and three in the rear Hindu part of the house while the remaining are situated separately. 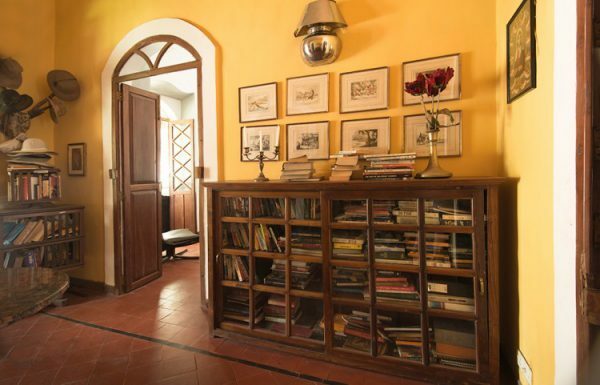 Vivenda has an enviable collection of books, furniture, photographs, and no TV. 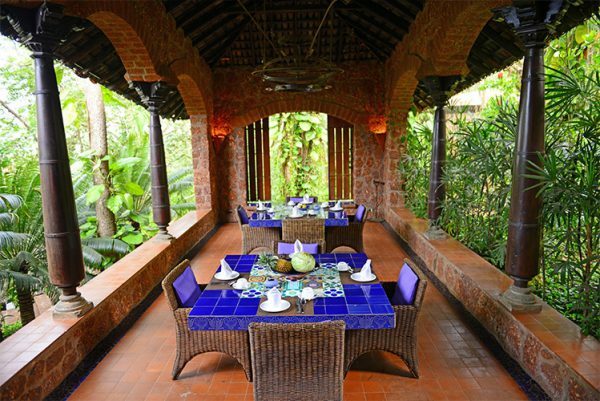 Also, there’s a huge dining table where you and your guests can enjoy eclectic Goan meals and lively conversations. Another quirky element of the house is its bar that is made out of lorry back. It is almost a kilometre away from the beach, you may ride one of the bicycles provided to guests or be dropped there in property’s customized blue striped auto-rickshaw. So while an intimate and eclectic wedding could be planned in its gardens, there’s also ‘Zeebop by the Sea,’ a beach shack restaurant just round the corner, which is adept at hosting weddings. 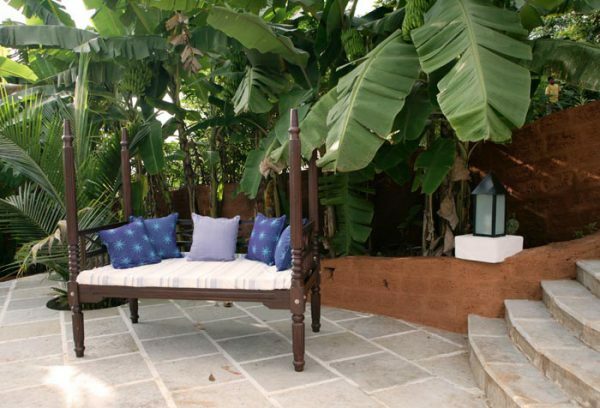 Either ways we highly recommend the serene yet sensuous Vivenda dos Palhacos for your intimate wedding in Goa. ‘Nilaya’ a Sanskrit word which translates to abode in blue or heaven. Living true to its name the eclectic hotel is done in hues of blue. Located in the traditional hamlet of Arpora, Nilaya is a hilltop boutique hotel surrounded by luscious foliage and the Arabian Sea. Its architecture is rather striking drawing inspiration from Mughal domes, Moorish arches and Arabian nights. There are 11 spacious and chic rooms that would put you and your guests at ease right away. 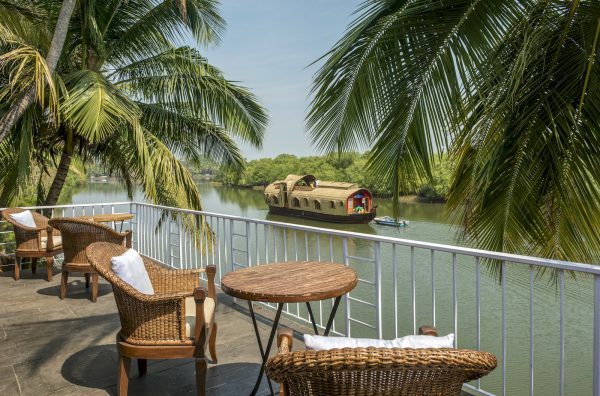 The restaurant and bar are set under a shaded terrace overlooking the pool and serves some of the best Goan cuisines and also gives you the luxury to create your own fine dining menu. Somewhat clandestine, Nilaya Hermitage is a fabulous choice for your destination wedding in Goa and can host an event for up to 80 guests. You could have your ceremonies by the poolside or in its lawns that have thick leafage and pockets of shade. We love this charming and luxurious boutique hotel and so would you, more so when you would see this kitsch and pretty Indian wedding planned here. 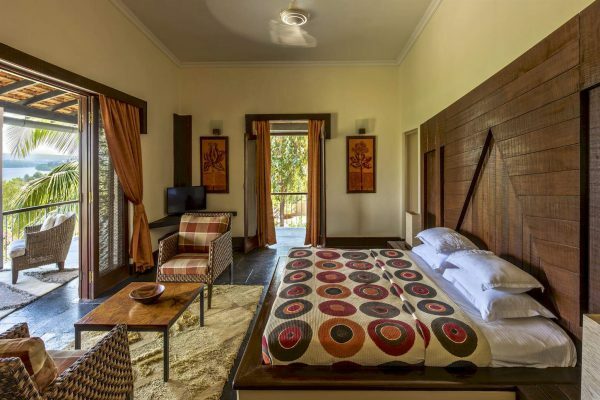 The Boutique resort with 7 villas is an ode and celebration of the old Goan architecture with features like sprawling verandas, inviting balcaos, vintage four poster beds, and mud tiles. 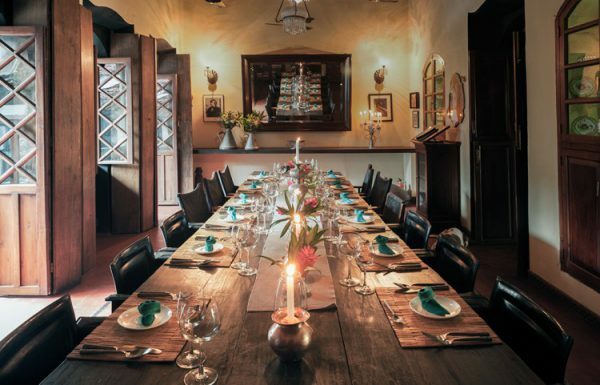 They have a collection of seven independent villas that can accommodate up to 30 guests. The underlined element is generous space and greenery. The natural green cover works like a lavender balm to the tired nerves. 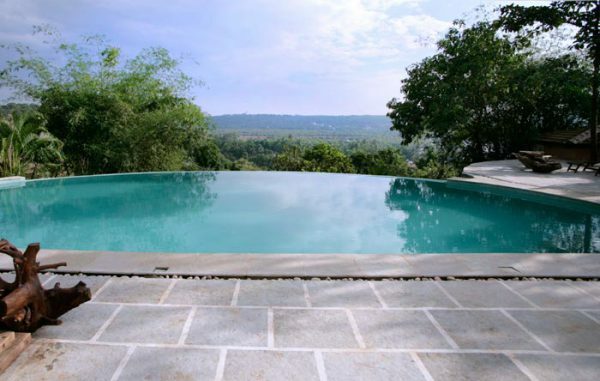 Then there’s a lethal and tempting combo of infinity pool with stunning views of the valley and the poolside bar. 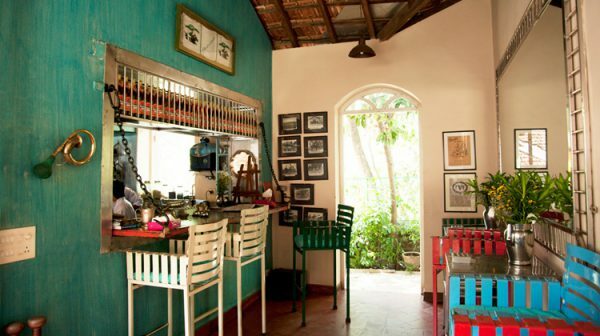 The in-house restaurant Mimosa serves World and Goan cuisine. 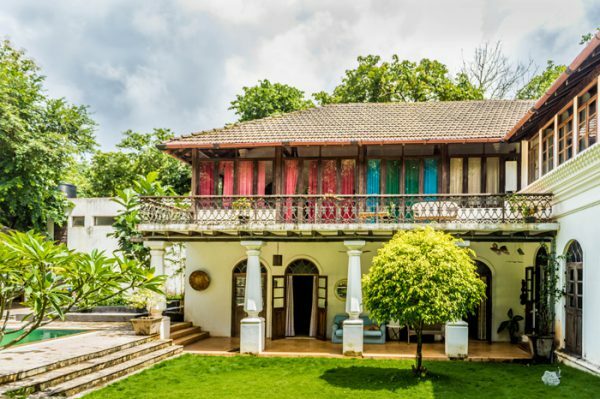 Located in North Goa on a hill, villa wedding here would be a private affair amidst nature and of course it would be something incredibly alluring and pleasant. Far removed from the eventfulness of North Goa, Bird Song is located in the quaint village of Moira, between the villages of Mapusa and Aldona. If there were a purpose of this idyllic property it would be to indulge its occupant in indolent nothingness. A two-hundred-year-old Portuguese villa of pillared verandas and high roofs has six graceful suites that exude a sense of warmth. 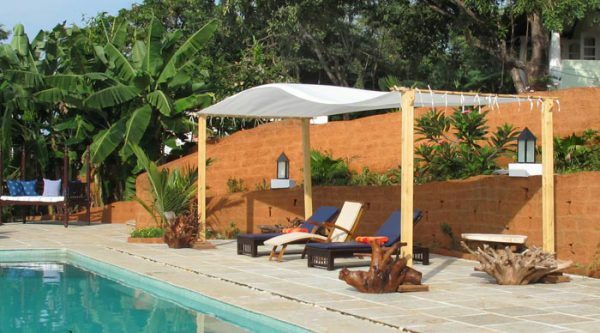 A huge L-shaped pool, well-stocked library, poolside lounge bar, massage and steam rooms, a kitchen that serves delectable Goan cuisine, the villa has all the requisite elements to ensure that you and your guests have the most pleasing time while here. And if you feel like soaking a bit of sun on the beach, hop on a cab and Baga beach is a few kilometres away or maybe just enjoy a leisure walk through the by-lanes of the village. Nestled amidst fruit trees, its offers soothing environs which are befitting for your intimate wedding with your dear ones. 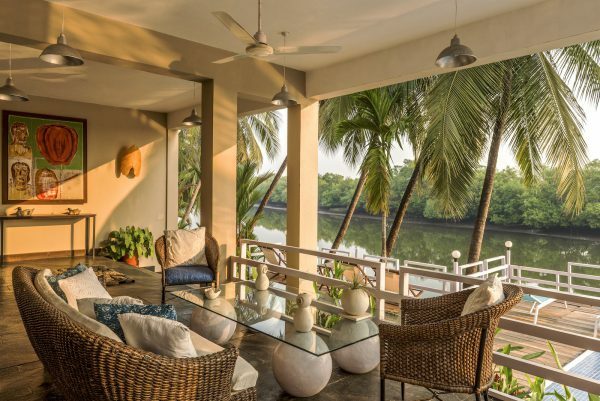 Tucked away on the serene banks of the river Chapora in North Goa is Casa Colvale. We reckon once here you would be spending a sizeable amount of time lounging about at its decks soaking in the views of gorgeous landscapes. If spectacular setting and privacy are chief requirements for your intimate wedding, Casa Colvale fits the bill perfectly. 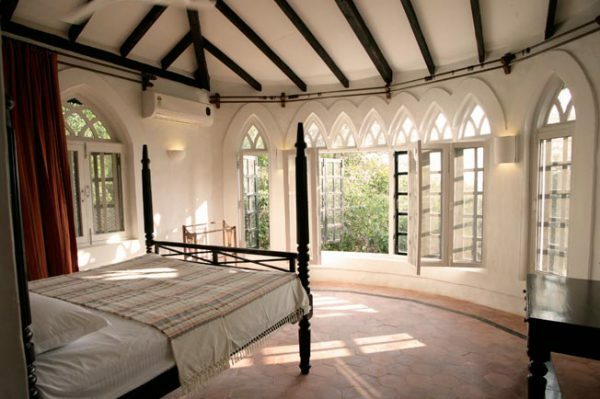 It has 12 rooms with huge windows and soothing views of backwaters and islands. If you and your wedding peeps would like to hit the neighbouring beaches of Ashwem/ Morjim, arrangements could be made to rent out a speedboat. Or maybe you could hire their private houseboat for a day and go for a fishing trip or for waters sports like kayaking and snorkelling. You and your wedding guests are promised to have a memorable time whist here. The wedding ceremony can be organized in casa’s lush gardens, decorated and styled into a picturesque venue for your intimate wedding. 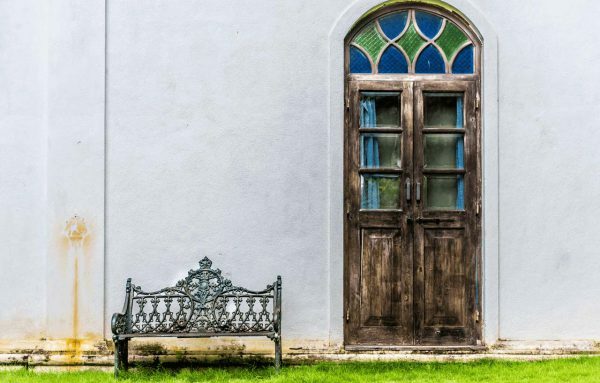 The romance and enchantment of having a wedding in a boutique hotel or a villa that is bursting with character is something that a standardized hotel cannot compete with. If your idea of luxury is your own personal space and wonderful laid back atmosphere, you know wedding in a boutique hotel or a villa is the thing for you. 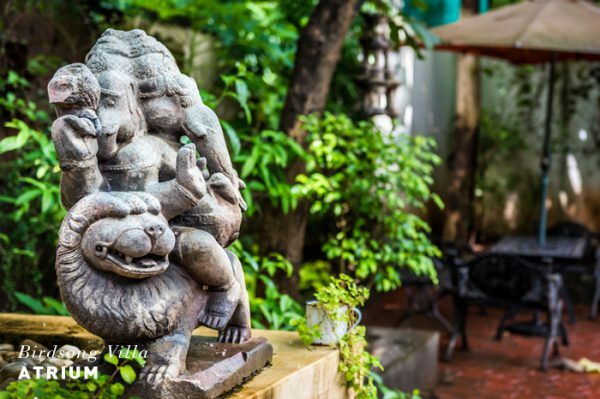 Goa that is soaked in the spirit of ‘Susegad,’ is ideal for your intimate villa wedding. We have a special spot of Villa Weddings, somehow the very idea resonates with us really well, so we would be delighted to help you plan your wedding and be a part of it. Always an email or a call away.